Joyful Noise is a visual reminder of the connection our worship creates between us and heaven, so that we might be mindful to cultivate it as we pursue intimacy with our King. 1 Samuel 10:5-6 (AMP) After that you will come to the hill of God where the garrison of the Philistines is; and when you come there to the city, you will meet a group of prophets coming down from the high place [of worship] with harp, tambourine, flute, and lyre before them, and they will be prophesying. Then the Spirit of the Lord will come upon you mightily, and you will prophesy with them, and you will be changed into another man. Hebrews 13:15 (AMP) Through Him, therefore, let us at all times offer up to God a sacrifice of praise, which is the fruit of lips that thankfully acknowledge and confess and glorify His name. In 1 Samuel 16:14-23, we hear about the impact anointed music can have in bringing peace. In this particular story, King Saul is being tormented by an evil spirit, and David’s harp playing is able to bring peace. 1 Samuel 16:23 (GW) Whenever God’s spirit came to Saul, David took the lyre and strummed a tune. Saul got relief from his terror and felt better, and the evil spirit left him. As one who has dealt with depression (see my post “Radio Silence”), I know firsthand how oppressive and debilitating that struggle can be. I don’t know how similar or different this is from what Saul went through, but as I read verse 23, that word “relief” resonated deeply for me. 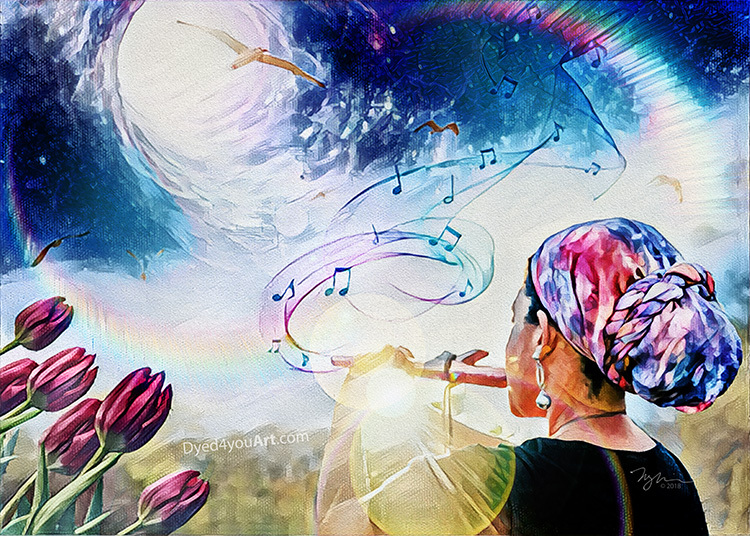 Recently at Papa’s prompting, I began playing Native American style flutes (Come Alive and Radical Transformation (A Flute Story)). I play every day, and I know that sense of relief firsthand as I release heaven’s song here on earth. I may not be a proficient musician, but it’s not about that because in the end it comes down to a heart attitude. Anointing comes when you surrender to Papa and move at His prompting. It’s about functioning in His flow and being living sacrifices (Romans 12:1). In other words, though some of us may be more skilled musicians than others, all of us are able. We’re called to make a joyful noise (Psalm 98:4, 100:1). I fully believe God loves an unskilled but surrendered offering (picture a loving parent admiring the scribbles of a toddler). In Ephesians 5:19, we’re even encouraged to sing psalms to one another – and that isn’t qualified by saying “those who are talented,” it’s for everyone! And these are just a few examples. So be intentional to find an outlet for releasing anointed praise and worship. Yield yourself to Him. Be a willing vessel. Make music and sing psalms – make a joyful noise – and allow heaven’s sound to flow through you and minister to God, those around you, and to yourself. Acts 16:25-26 (GW) Around midnight Paul and Silas were praying and singing hymns of praise to God. The other prisoners were listening to them. Suddenly, a violent earthquake shook the foundations of the jail. All the doors immediately flew open, and all the prisoners’ chains came loose. 1 Samuel 10:5-6 (VOICE) …Musicians leading them will be playing harps, tambourines, flutes, and lyres; and the prophets will be caught up in prophetic ecstasy. Then the Spirit of the Eternal One will overtake you, you will be caught up in the same prophetic spirit as these prophets, and you will be changed into a different person. Beloved, lose yourself in life-changing praise. Surrender to My Spirit, and yield yourself to Me. Walk away changed, for I inhabit the praises of My people. Be empowered by Me and made new. And in your “new” self walk in deeper levels of boldness of faith and purity of heart – of depth of compassion and unconditional love. Be like Me, beloved. May you reflect My nature, and may your words echo Mine just as your heart reveals My love. Hebrews 13:15 (TPT) So we no longer offer up a steady stream of blood sacrifices, but through Jesus, we will offer up to God a steady stream of praise sacrifices—these are “the lambs” we offer from our lips that celebrate his name! Beloved, may the fruit of your lips pour forth in praise to the One who is worthy. You have a choice of whether or not you bring forth fruit, and what kind of fruit it is. Will you withhold that which I AM worthy of? Or will you give it to another? Surely as you nurture a heart full of gratitude, you will find yourself unable to hold back your praise. So cultivate a heart of thanksgiving and release your song of joy and love that the fruit of your lips might be sweet. During the birthing of the word for this piece (which in this case began before the Art was created), Father began highlighting lips and the fruit of our lips (praise). Then as the piece was being created He began nudging that there should be flowers in it. In looking through the meanings of flowers, tulips were highlighted because their meaning is a “declaration of love” which fit wonderfully with the offering of praise this piece depicts. Suddenly, we realized God was also being punny by including tu-lips (two lips)! What a fun reminder to be mindful that the fruit of our lips is an ongoing declaration of love for our King. Psalm 57:8 (TPT) Awake, O my soul, with the music of his splendor-song! Arise, my soul, and sing his praises! My worship will awaken the dawn, greeting the daybreak with my songs of light! Beloved, may your song burst forth like the glory of the new day – bringing light and life to all around you. May it shift the atmosphere and bring heaven to earth. And may the song of joy resonate in the hearts of men. Bring glory and honor unto My name, beloved. Refuse to hold back. Release your sound of joy. And in glorious splendor exalt Me with bold, uninhibited soul-awakening, spirit-stirring song. A meditation from Naudia Willbroad is connected to this. As I was praying over this art piece God highlighted a different scripture, Genesis 28:12-17 (AMP), and specific words like “garrison,” which means: a body of troops stationed in a fortified place, that didn’t seem to fit what was being birthed. I asked for revelation and feel like God is wanting to acknowledge that making a joyful noise and becoming a changed person looks different for everyone and that it isn’t always easy. There are seasons in our life where lifting up a joyful noise and declaring our love to God is a sacrifice yet our desire is to remain in relationship with Him. As we choose to walk in obedience into the position or place He calls us He will change our hearts and our mouths will be filled with praise. I pray that you would be courageous and walk forth with songs of praise into the land of promise God has established for you. I pray He enlightens your heart and transforms your mind that you would declare His promises and trust His word over your life. There may be sacrifice involved when you become changed. You may have to walk in radical obedience as you challenge a garrison or stronghold in your life that has kept you from walking into your promise land. May you sing praises to God and keep your eyes fixed on Him and watch how He guards you, protects you and provides for you as you walk into the land He has promised for you. Be encouraged. Stay the course and declare your love for your Beloved as He cares for you. Psalm 141:2 (TPT) Let my prayer be as the evening sacrifice that burns like fragrant incense, rising as my offering to you as I lift up my hands in surrendered worship! One of the locations where the Tabernacle of God resided was in Nob. Nob, which in Hebrew means “high place” (H5011) is the same as the word niyb (H5108), which means “fruit.” Niyb comes from the root word nuwb (H5107) which means to “bear fruit, bring forth, to make flourish, increase, or make cheerful.” This theme is reminiscent of the Apostle Paul’s exhortation in Hebrews 13:15, “Therefore by Him let us continually offer the sacrifice of praise to God, that is, the fruit of our lips, giving thanks to His name (NKJV). To be the tabernacle or temple of the Holy Spirit, we are called exalt God through our lives. Through the fruit of our lips—in word or song—we can offer up the sacrifice of praise and thanksgiving to the One who fills us. Joy is a fruit that is imparted through the Spirit (Galatians 5:22). Bearing this fruit is a process. Often we must press through difficult times (or difficult times come to press us). We may start by declaring the words of Scripture or singing songs of worship, yet may not quite feel as if we’ve grasped the truth of what we are declaring. Even so, we desperately cling to these words needing them to be true. Those words go down into the depths of our soul like seeds. In time, the Spirit brings forth a harvest of true joy from those seeds. The words that we have said and the songs that we have sung suddenly ring true as we experience God’s faithfulness. 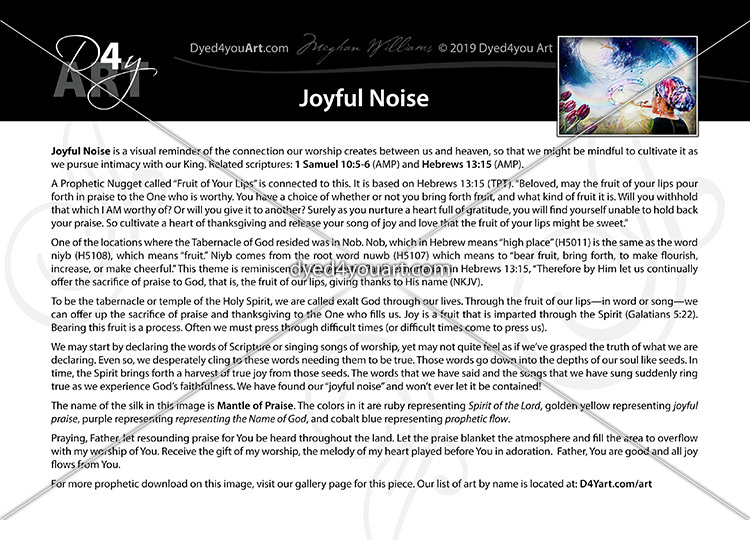 We have found our “joyful noise” and won’t ever let it be contained! The name of the silk in this image is Mantle of Praise. 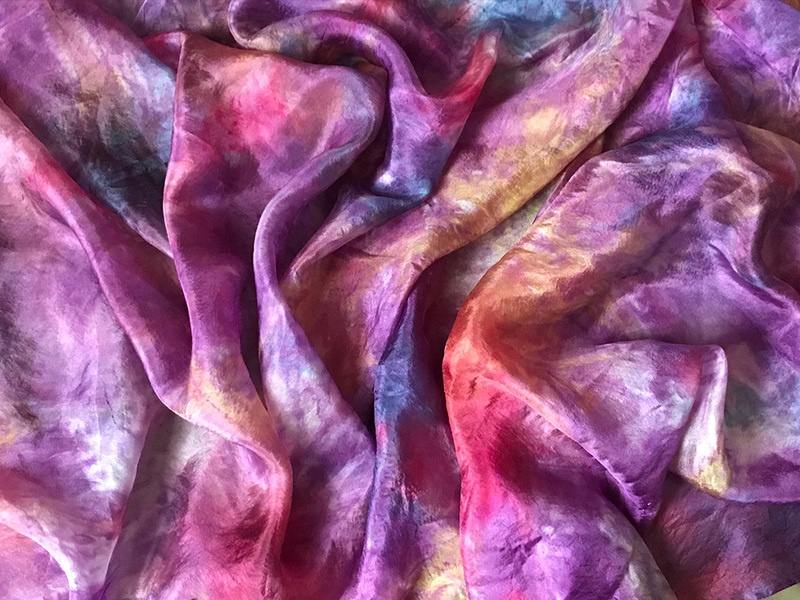 The colors in it are ruby representing Spirit of the Lord, golden yellow representing joyful praise, purple representing representing the Name of God, and cobalt blue representing prophetic flow. Praying, Father, let resounding praise for You be heard throughout the land. Let the praise blanket the atmosphere and fill the area to overflow with my worship of You. Receive the gift of my worship, the melody of my heart played before You in adoration. Father, You are good and all joy flows from You.